Click for original story here. Iowa Great Lakes, home to multimillion-dollar vacation homes and a playground for thousands of tourists each year, could become the next battleground over the construction of large animal-confinement operations. Dickinson County leaders have written to Iowa’s governor, state natural resources leaders and lawmakers, asking for a temporary moratorium on new animal-confinement operations. Leaders say a “proliferation of animal confinements” — thousands of animals producing millions of gallons of manure — threatens the water quality of the state’s natural glacial lakes. Not only are West and East Okoboji and Spirit lakes important state natural resources, but they’re a key economic driver for the region, attracting $265 million in tourism spending, based on the most recent data available, and a significant workforce and business recruitment tool. Lonnie Saunders, Dickinson’s assistant county attorney, said a moratorium would enable Iowa — its residents and leaders — to retool the state formula for determining appropriate sites. Changes to the master matrix could build in better protections for water quality and address concerns about odor, health and possible environmental impacts, he said. New Fashion Pork, the company behind the confinement proposal to house up to 4,400 animals, says it has taken great care not to build within four miles of the Great Lakes, honoring a 2006 agreement made between big pork producers and local leaders. And it’s making concessions that include removing some farmland from its manure-application plan that local leaders say is too close to the lakes’ crucial watersheds. The Minnesota-based company plans to resubmit a modified proposal. Livestock production is a massive industry in Iowa, generating about $13 billion in receipts in 2013. The state is the nation’s largest pig producer, with about 20 million animals, about 5 million more than a decade ago, according to data from the U.S. Department of Agriculture. Iowa produces about one-third of the hogs raised in the U.S. But complaints about Iowa’s livestock industry have grown with its increasing size and concentration. Even though Iowa is raising more pigs, the animals are consolidated into fewer facilities, which have decreased by nearly 4,000 in a decade to about 6,300 in 2012, the U.S. Agriculture Census shows. Joe Ulman, a member of the Big Spirit Lake Protective Association, said the smell of pigs is becoming more common in hot, humid summers on the lakes. “Will people still come back when they can smell manure being applied to fields three miles from the actual confinement?” Ulman said. Residents also complain that water quality is being degraded by algae blooms — fed by nutrients from livestock facilities, wastewater-treatment plants, urban lawns, and corn and soybean farming. Dickinson County, he said, has 39 animal-feeding operations small enough that they aren’t required to meet the matrix requirements. The county has three larger facilities — two cattle and one hog — that are governed by the matrix. “There are fewer animal operations overall in Dickinson than any county in northwest Iowa,” Johnson said. Dickinson County had about 43,200 pigs in 2012, about 5,400 more animals than in 2001, according to the U.S. Agriculture Census. By contrast, Sioux County, in the northwest Iowa corner, had 1.2 million pigs, the most in the state, the census showed. Bill Van Orsdel, a Des Moines businessman and president of the Iowa Great Lakes Association, said three hog confinements have been proposed or constructed within the past 18 months. It concerns his group and others. Last month, a coalition of environmental groups sued the U.S. Environmental Protection Agency, pushing it to set standards on the amounts of ammonia, hydrogen sulfide, fine particles and other emissions from livestock facilities, claiming they threaten the health of nearby rural residents and workers as well as animals in the facilities. Hog, cattle and dairy farms have been blamed for fish kills caused by manure spread on crop fields or spilled directly into streams. For example, a dairy spill last fall in O’Brien County in northwest Iowa killed about 865,000 fish. The company was fined $160,500. And neighbors have long complained about respiratory irritations, asthma and annoying odors they link to the farms. Some university studies have supported those contentions. But an Iowa State University professor said research is inconclusive about the confinements’ effect on public health. Large animal-confinement operations use complex ventilation systems to prevent animals and workers from exposure to ammonia and hydrogen sulfide, said Daniel Andersen, an associate professor of agricultural and biosystems engineering. Dickinson County officials aren’t the first to challenge Iowa’s master matrix, a tool created by a 2002 law that was designed to give livestock producers uniform regulations across the state and provide greater protections for residents. The matrix requires large pig, cattle and other livestock facilities to meet construction and setback requirements. The facilities must meet separation distances for homes, schools and churches as well as recreational areas and water sources. Producers also have to identify the farmland where the facilities’ manure will be applied. But critics say the matrix allows livestock producers to build too close to people, public places and environmentally sensitive areas such as rivers or streams that can be sources for drinking water. Criticism about farming’s impact on water quality came to a head last month when Des Moines Water Works notified drainage districts in three rural Iowa counties — Calhoun, Buena Vista and Sac – that it planned to sue them. The utility claims the drainage districts, and indirectly crop and livestock producers in the area, are contributing to high nitrates in the Raccoon River watershed that have forced the agency to use expensive equipment to filter the water. The utility’s notice to sue says nitrogen levels in one drainage district feeding the Raccoon River have been nearly four times higher than the amount the federal government says is safe for drinking water. Infants younger than 6 months are particularly at risk from high nitrate levels in water, potentially becoming seriously ill without treatment. Saunders, the Dickinson County assistant attorney, said county leaders are sympathetic to downstream concerns about high levels of nitrogen and phosphorous levels in Iowa streams or rivers. But county leaders have little power to prevent producers from locating in ecologically sensitive areas, he said. Counties that have environmental concerns such as Dickinson should “have something to say about the location of these things,” said David Osterberg, co-founder of the Iowa Policy Project, an Iowa City research group that has supported tougher environmental protections. Past efforts to modify the master matrix have run into agricultural brick walls, Osterberg said. Groups as diverse as the Iowa Association of Counties and the Iowa chapter of the Sierra Club each year include in their legislative priorities greater local control over siting of large, concentrated animal-feeding operations. But leaders from both groups say they have few hopes to push the issue forward. Sen. Johnson of Okoboji said reopening discussions about Iowa’s master matrix would be a mistake. “The master matrix has worked well for the state, and I see no reason to make changes,” said Johnson, who helped draft the 2002 law and helped broker the local agreement with large pork producers to stay at least four miles outside of the Great Lakes area. Adding confinement restrictions around lakes, streams, towns or cities in the state matrix would eventually leave few places for farmers to build livestock facilities. And that would prevent families from bringing their sons and daughters into their operations, he said. With strong prices for beef and pork, Saunders expects to see more confinement operations around the Lakes. And it’s possible that not all of them will honor the 2006 agreement to locate four miles outside the Great Lakes area. “You can only get beaten down so many times before you give up,” he said. New confinements with more than 2,500 pigs must apply for a state construction permit — a more stringent requirement than federal law — that state engineers review. Producers building a confinement for 1,250 to 2,500 pigs must submit a construction design statement to the county outlining the standards they’ll use. All producers building confinements for 1,250 or more pigs are required to have manure management plans. Most small producers are not required to meet those requirements. The state restricts how close animal confinements can be to homes, schools and other areas. Larger facilities require more distance than smaller ones. 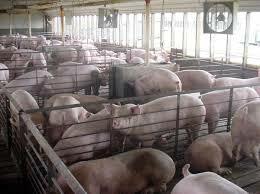 For example, new confinements with fewer than 1,250 pigs can build next door to a neighbor. Confinements with fewer than 2,500 hogs in a rural setting require 1,250 feet of separation around them. Confinements must be 500 feet from a water source, such as a well, and 1,000 feet from a major water source. Counties can provide input into approval of large confinements through a master matrix. Every facility must meet minimum requirements, but producers can choose from 44 items actions that “go above and beyond” the basic requirements to gain county approval. Producers who fail to get a passing score can ask the state Department of Natural Resources for a review. Those who fail to get DNR approval can appeal to the Iowa Environmental Protection Commission.